Finsternis was this morning’s soundtrack for my commute to work and it was somewhat of an assuring listen. With the perpetual clockwork of drone trio Aluk Todolo’s new album there was consolation attached that, when I wasn’t moving for minutes at a time, their music was always in a state of continual march. As two-sides of an LP, chapters of an ongoing story that continue till there’s no tread left for the needle to scratch, Finsternis is what you think of when you imagine walking on the shoulder of some gritty, expansive highway after your car breaks down, hoping that just beyond the bend, there’s a pit stop, a gas station, a police station... Something that will get you off your feet and on your way. Granted, that doesn’t sound too hopeful, or even pleasant, but those ever long inconveniences we face where time seems to slow to some obscene crawl, and the world never feels more round and constant, make enough of an impression in our day to day lives that it deserves this type of sonic claustrophobia and wisdom. More often than not, I’ve cited Sonic Youth (Ciccone Youth)’s “Macbeth” to sort of explain a type of rhythmic monotony with guitar effects driven into spatial and dissonant relationships within the music’s own wide and enveloping world. 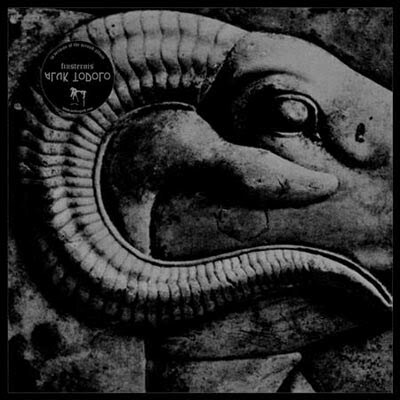 With Aluk Todolo, their acidic drone is more confined to a dwelling, almost suffocating in its closeness and its air of impending dread and B-Movie crudity. The first side’s two movements: “Premier Contact” and “Deuxième Contact,” are a little over 18 minutes of guitar screech that expands on the tracks’ eerie and patient backdrop. It’s just a loop with built intensity that really never blows its load, just sort of remains content to remain in flux. Yes, it goes nowhere, but the rhythm begs attention. There’s something to this music that, in lesser hands, would justifiably meet a slanderous response. The remaining side, whose components “Totalité,” “Troisième Contact,” and “Quatrième Contact” also bleed into one unifying idea, adds more space and colossal doom before degenerating into a cymbal smash and tunneling guitar cacophony. There’s more contrast between ideas for the album’s b-side, though Finsternis is all about consistency of motion, the fundamentals of patience and how both can sometimes drive one to slowly lose touch with reality. Me? I lost touch with my commute and suddenly woke up in my parked car once the album ended. Weird start to the morning.